“O God, for another day, for another morning, for another hour, for another minute, for another chance to live and serve Thee, I am truly grateful. all weakness when Thy power is at hand. Power to lift me to Thee. Be Thou with me for another day, and use me as Thou wilt. For Christ’s sake I pray. 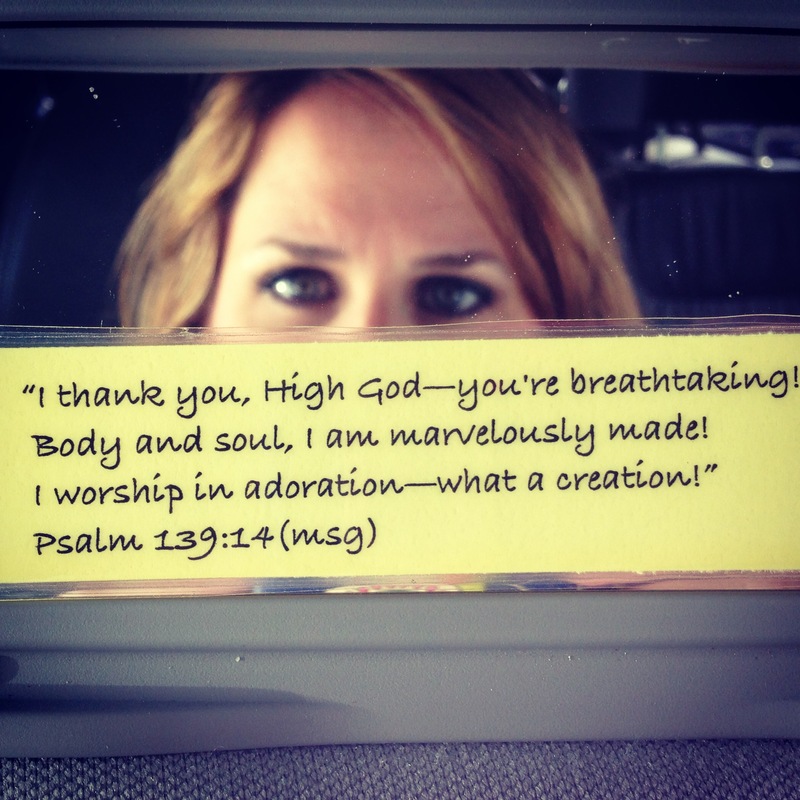 Some days… when standing before my reflection, stripped of everything… motives, guilt, expectations, past images, I can honestly look at my body and speak the words of Psalm 139 with great certainty. I do well most of the time, but when the body image monster sneaks up on me, it does so with a vengeance. I go from being comfortable in my skin to feeling like the reflection in a fun-house mirror. I wonder whose body I’m trapped in and when the merger occurred. I see my curves as too curvy. My hair appears dull. My laugh lines are deep and obvious. My image is distorted. It’s no secret that my relationship with food and exercise is less than ideal. I have talked with many of you since seeing the movie “Lone Survivor.” It has changed me and I plan to write about it very soon. I watched this video today that shows families reactions to soldiers coming home. Again, I wept. Shouldn’t we all weep knowing that these men and women spend months, sometimes years away from their loved ones and risk their lives for our freedom? The same freedom that so many of us see as free. Darlins’, we need all be weeping. Yesterday I disappeared…from social media, that is. And as ridiculous and spoiled as it sounds, it was incredibly difficult. I realized how often I quickly scroll through Facebook, Twitter and Pinterest on my phone while sitting in traffic, in the carpool line, at my kitchen table, in the drive-thru at Starbucks, before falling asleep…crazy right? It was eye-opening and heartbreaking to think of how technology has become so second nature that it’s a reflex when so many have no voice. When I want to say something, often of no importance, I hop on one of my many social media outlets and “express myself.” Yesterday, I had to stop multiple times throughout the day from logging into the loop of instant updates. As I sit here on my chenille sofa, typing on my MacBook Pro, with a cup of hot tea at my fingertips (to help soothe the cold I feel coming on), I am forced to think of the 27 million people for sale. And it took tearing my grip from social media for 24 hours to really get my attention. Well, that depends on you. Honestly, I don’t know my part in all of this. I don’t know where my place is and how I can be an ember amid massive atrocity and unfathomable evil? The one thing I know to do is share it with you. The one thing I can do is write. So today, here in this place, I will raise awareness with my voice, for the many who’ve been silenced and left without choice. Today, I will do what I can with what I have. Next, watch the short clip below, think about the faces fading in and out on the screen…picture someone you know in one of these hellacious scenarios…what would you do? Where would you start? Will you share this information on your blog, website and in your social media circles? You may not think it’s a lot, but it’s so much more than nothing. Every picture you click on in this post with the End It logo will take you to their website. I will also have a button on the right side of my site with the End It logo that will lead to their website as well. For more information and facts on slavery, you may download these PDF documents taken directly from the END IT website. Thank you.